The best way to get the most out of your Mac is to automate tasks. But if you’re new Mac automation, you might not realize what tasks you could automate using Mac automation applications. Save you steps in a process. Reduce typing, clicking and mouse movements. Reduce errors in a process. Save you time the more use the automations. Help you create workflows for tasks and projects you regularly do on your Mac. Save you manual labor steps and time. And if you’re using your Mac for business, Mac automation could save you money. Mac automation is useful for anyone who uses his or her computer on a regular basis, and especially for bloggers and writers, photographers, writers, graphic designers, accountants, marketers, and software developers. But Mac automation won’t make sense if you don’t know what questions to ask about what could be automated. 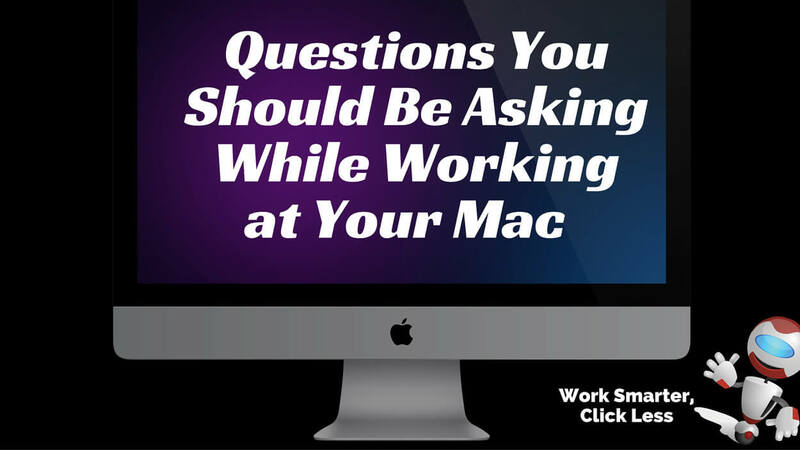 Below I list several questions you should keep in mind while working at your Mac. I’m not saying that you have to keep the questions in front of you at all times, but I am recommending that when you see yourself performing any task more than three times in a row on your Mac, that task is probably a good candidate for automation, or at least using a tool that will reduce the steps or clicks you need to perform the task. Which applications do I activate and or launch on a regular basis? What words, phrases, URLs, snippets of text do I frequently type? What words do I frequently misspell? Which applications typically clutter up my workspace? How many steps and clicks am I using to accomplish a particular task? When I launch a particular application, what do I typically do next? Which shortcut keys do I typically use in an application? How often do I move the cursor to the menu bar to activate menu items? How often do I hit the backspace button to delete the last word I type a misspelled? How often do I have to move my hand back and forth between the keyboard and my mouse or trackpad? How often do I pause or play iTunes on a regular basis? Which buttons or application features do I enable and disable on a regular basis? What online forms or text boxes do I regularly fill out? Which character keys do I type on a regular basis that interrupt my typing flow, such as @, $, *, [, !? Which menu items do I use the most in particular applications? Which tasks do I forget to perform on a regular basis? What emails do I send out every week? Which iTunes playlists do I play on a regular basis? How often do I perform Google searches, or search a particular website? How often do I copy and paste text on my computer? Hopefully these questions if you some idea of what can be automated on your Mac, so that you can go from being a Mac user to a Mac automator. 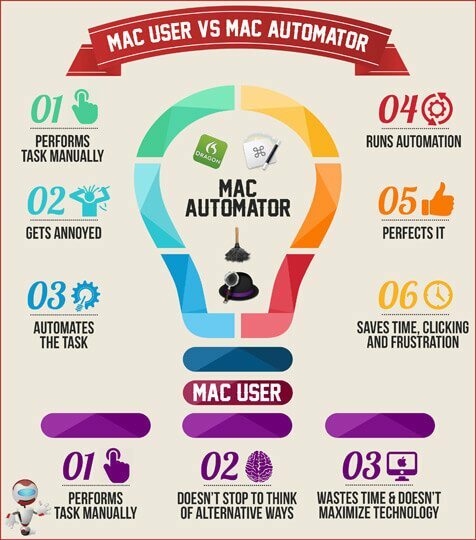 The difference between a regular Mac user and Mac users who regularly automates tasks, is that the Mac automator gets annoyed when he or she has to perform a task over and over several times. The regular Mac user on the other hand performs a task without thinking about possible automations because he or she may not know that there is an easier or more efficient way to perform a redundant task. 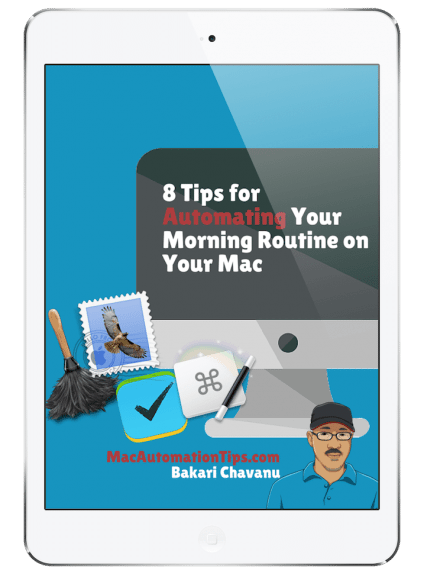 But the Mac automator will stop and figure out how to use a Mac tool to reduce the steps or completely automate the task. While developing an automation may take some time, the Mac automator knows he or she will regain that time and lots more once a task is automated and used on a regular basis. 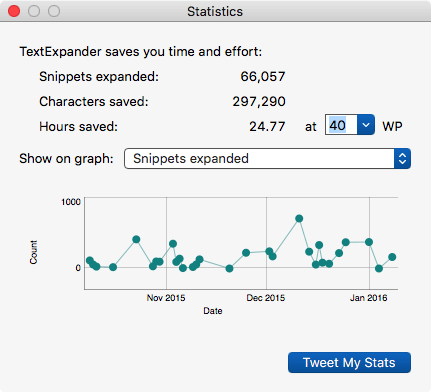 For example, TextExpander (affiliate link) has expanded or corrected over 66,000 words and/or phrases for me. 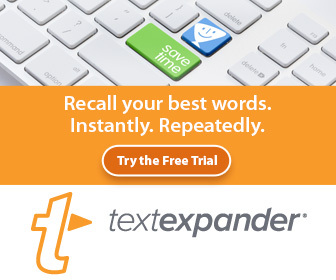 It not only reduces typing, but by the application’s calculation, it has saved me over 24 hours, at an average typing speed of 40 words per minute. 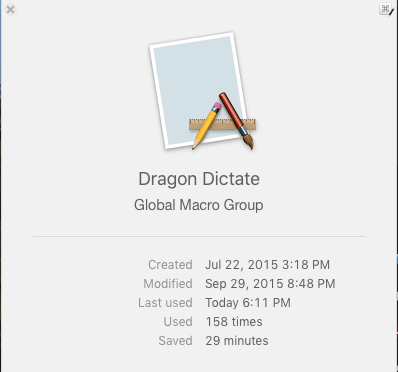 Keyboard Maestro has saved me, according to its calculation, 29 minutes since July for the 158 times I have enabled and disabled Dragon Dictate (DD) using a string trigger as I type. It’s difficult to verify the actual time, but I find that it’s much easier to mute or un-mute DD by typing three assigned letters than it is to left my hand off the keyboard to press the assigned hotkey or to using the mouse to manually click the DD button. Overall, Keyboard Maestro has saved me up to four months of work because I use a few dozen actions like the one above on a daily and weekly basis. 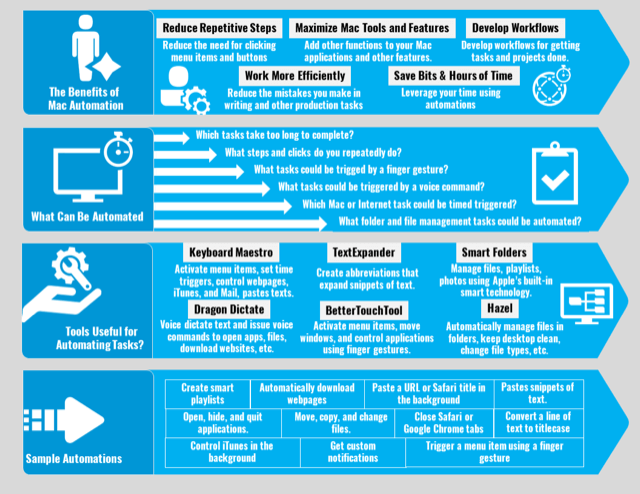 When you find yourself performing a task three or more times and on a regular basis, it means that you should consider ways to automate that task or reduce the steps. There are automation applications that can make each of the tasks listed above easier or quicker to perform. Keyboard Maestro, for example, can launch regularly used applications, files or webpages using according to a set time and day(s). TextExpander can type snippets of text based on assigned abbreviations you set for each snippet of text. 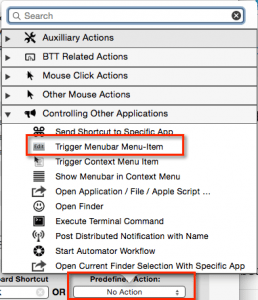 You can trigger iTunes to pause or play from within any application using BetterTouchTool or Dragon Dictate. A task management application, like 2Do or OminFocus, can be used to remind you of regularly recurring tasks you need to get done on a daily, weekly, monthly, or yearly basis. Keyboard Maestro can type special characters using what are called string triggers. For example, I type the “@” character simply by typing “fd” so that I don’t have to lift my hands off the keyboard as I type. I also use another stringer trigger “jk” to quickly delete the last word I type. I do quick Google, website, or image searches using Alfred, saving my several clicks in the process. These are just a few of automations that can be done with the right program. And best of all, these automations don’t require any coding skills. While automating tasks on your Mac doesn’t always require coding skills, it does require that you become familiar with what automation applications can do. Notice what tasks you perform on a regular basis. Read about which Mac automation applications might help you automate those tasks or reduce steps. Start with one automation application and become familiar with what it can do. When you have some time, create a few automations and see what difference they make in your workflow. Browse this website for reviews, ideas, and examples of what Mac automation applications can do. Ask questions in the comment section below about your particular automation needs. If you’re new to Mac automation, let me know what questions you have about Mac automation. If you’re experienced with Mac automation, please share how you use automations in your daily workflow. Can you suggest a good way to sorts a list of text items or lines alphabetically? You can use an app called PopClip, and download an extension to it that will alphabetize selected lines of text. Let me know if you need more assistance. The shell command “pbpaste | sort | pbcopy” will sort the lines in the clipboard. The sort command has a variety of options to control how it sorts. Executing the shell script is trivial using Keyboard Maestro or other utils. Hi Peter, thanks for your comment. I’ve never used shell commands with KM, so I’ll try it out. For us non-coders, hardly anything is trivial, :).